Powazek: Just a Thought: Cameras For Sale! Just a thought from 27 March 2005 about For Sale, Photography. SOLD! Canon Digital Rebel / 300D: $599 A perfect camera if you've only ever used point-and-shoots and are thinking about moving up to a digital SLR. A little over a year old and in fabulous condition. SOLD! Nikon Coolpix 4500: $299 If you've never used a swivel camera, you don't know what you're missing. Great for casual shooting. 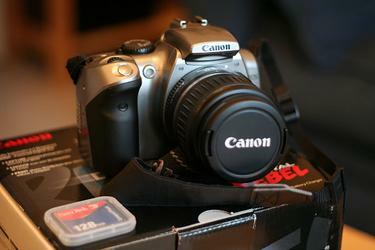 Canon Digital Rebel / 300D: SOLD! Canon's brilliant digital SLR. I've used this camera for a year and loved every shot. The camera's never let me down. 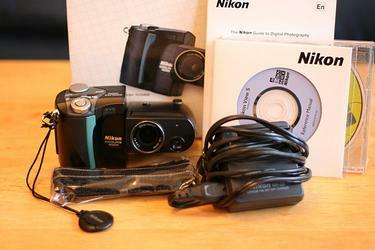 I'm only selling it because I got a new digital camera. You can see the photos I took with it at Ephemera.org. All original manuals and CDs in original box! My favorite sneaky camera! With the swivel lens, you can hold the camera at waist level to shoot surreptitiously. Very quiet shooting and great shots! I've owned this camera for a couple years but haven't used it much since I got the Canon Digital Rebel. It'd be perfect for a casual shooter who still wants quality prints. Camera in excellent condition - barely used. This section is called Just a Thought. It's a blog where I post little pieces of what I'm thinking about at the moment. This page is an individual entry called “Cameras For Sale!” that I wrote on 27 March 2005. Before this, I wrote a little something called “Vote Chawazek!” on 21 March 2005. After this, I wrote “Ephemera Recognized” on 31 March 2005.